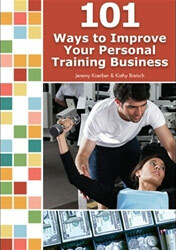 Here’s your chance to learn how to go from being a great personal trainer to a successful business person! This 6 hour online interactive video enhanced workshop will provide you with the knowledge and tools need to increase your customer base and make more money! Specific topics include: Developing your business strategy, establishing your line of products and services, setting prices, promoting and selling your business and developing and maintaining relationships that are key to your success. Mark has held positions in the Exercise / Strength & Conditioning industry, which have included Fitness Trainer, Physical Rehabilitation Assistant, Sales Associate, Fitness Manager and Facility Supervisor since 1987. He has been responsible for training basketball players in professional leagues, including the National Basketball Association, since 1996. Mark has been working with the World Instructors Training Schools since 2000. This [Business Success Skills] class covered all aspects of becoming an independent fitness entrepreneur and provided all the useful tools to be successful. I am now educated & exposed to the business world in order for me to grow successfully my own business with personal training. I actually now have a concrete business plan and feel confident that I can take the first step in starting my personal training business. It provides great flexibilty to move through the course at my pace and my convenience, from the benefit of doing it from home.